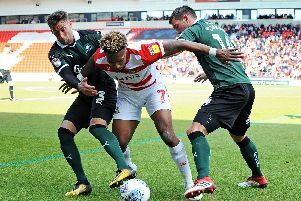 Doncaster Rovers need to get the balance right as they look to slalom their way to League One safety, Darren Ferguson has emphasized. The going is expected to be heavy at the Keepmoat Stadium on Monday night for the visit of Bradford City. And Ferguson wants to see his team - who are five points above the drop zone - pick the right moments to play and the right moments to be more pragmatic. “I looked back at the Southend game last weekend and there was a lot of good stuff,” said Rovers’ boss. “I felt the balance of the performance was better than at Rotherham, in the sense that we played better football at the right times. “We played some good football actually, and cut through them quite easily at times - the way I want us to. We played the shape better and I thought there were some very good performances. I thought the players that came back into the team - Houghton, Wright, Baudry - were very good. “We had a really great chance with Kiwomya and looking back at it I think he should score. “But a lot of the stuff we did I felt we did well, obviously on a terrible pitch. “I think that’s the way the games are going to be now. I don’t think you’re going to see really attractive games from now until the end of the season. “I went to the Bradford Wigan game on Wednesday night and you’d probably say Wigan are one of the better footballing teams but it was very back to front because of the conditions and the pitch. An English Schools FA Cup final was postponed earlier in the week and Doncaster RLFC play at the Keepmoat Stadium tonight - so getting to grips with the conditions will again be crucial come Monday. “I think we have get the balance better,” said Ferguson. “I felt at Rotherham we did a lot of good stuff in terms of the pressing and managing to turn them in the right areas. That was a different type of game because the pitch was actually okay there. But I felt we didn’t do enough of the other stuff in terms of having composure in our game. “Against Southend I thought we did that much better. “Against Fleetwood at home I felt we did it well when we went 2-0 up. We got control and a bit of confidence. “So it’s just about getting the balance right between the two. “Obviously on Monday, given the weather it looks like we’re going to have, the pitch isn’t going to be great because there’s a rugby game on it on Friday night and there’s more heavy rain forecast.